DUCK AND COVER After shooting a projectile at the asteroid Ryugu’s surface, the Hayabusa2 spacecraft caught this picture of a dust plume rising from the impact site. Hayabusa2 has blasted the asteroid Ryugu with a projectile, probably adding a crater to the small world’s surface and stirring up dust that scientists hope to snag. The projectile, a two-kilogram copper cylinder, separated from the Hayabusa2 spacecraft at 9:56 p.m. EDT on April 4, JAXA, Japan’s space agency, reports. Hayabusa2 flew to the other side of the asteroid to hide from debris that would have been ejected when the projectile hit (SN: 1/19/19, p. 20). Scientists won’t know for sure whether the object successfully made a crater, and, if so, how big it is, until the craft circles back. But by 10:36 p.m. EDT, Hayabusa2’s cameras had captured a blurry shot of a dust plume spurting up from Ryugu, so the team thinks the attempt worked. “This is the world’s first collision experiment with an asteroid!” JAXA tweeted. Hayabusa2 plans to briefly touch down inside the crater to pick up a pinch of asteroid dust. The spacecraft has already grabbed one sample of Ryugu’s surface (SN Online: 2/22/19). But dust exposed by the impact will give researchers a look at the asteroid’s subsurface, which has not been exposed to sunlight or other types of space radiation for up to billions of years. If all goes as planned, Hayabusa2 will return to Earth with both samples in late 2020. A third planned sample pickup has been scrapped because Ryugu’s boulder-strewn surface is so hazardous for the spacecraft. 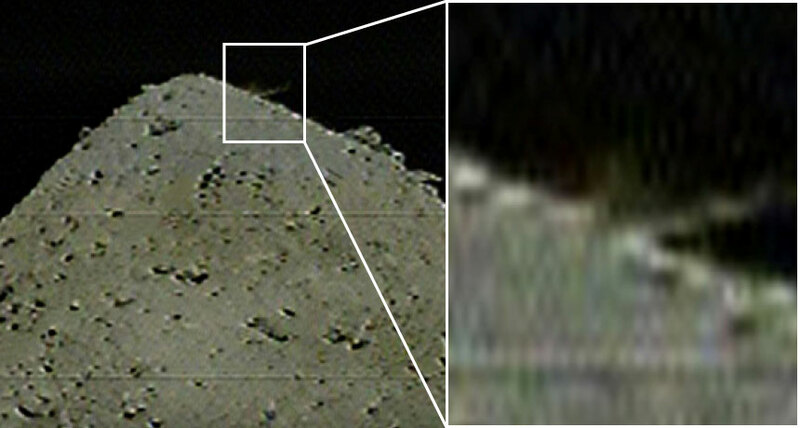 Comparing the two samples will reveal details of how being exposed to space changes the appearance and composition of rocky asteroids, and will help scientists figure out how Ryugu formed (SN Online: 3/20/19). Scientists hope that the asteroid contains water and organic material that might help explain how life got started in the solar system.